Going cage diving in Gansbaai is one of the best ways to enjoy up-close encounters with one of nature’s most fearsome predators – the legendary great white. Known for its prodigious hunting expertise and prowess, the animal’s sleek, torpedo-like form certainly inspires an awed response from those privileged enough to witness it. 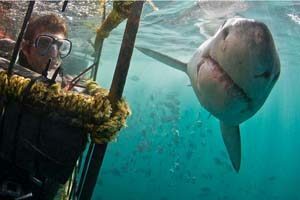 When you go great white shark cage diving it is an adrenaline-pumping experience. All at once the apex predators appear from the murky depths, accelerating with a powerful flick of their tales as they race towards the iron bars of the cage, jaws open revealing rows of razor sharp teeth. The evolution of the shark is full of gaps and theories, due to the animal’s cartilaginous skeleton, which unfortunately means that few fossils remain. Thousands of fossilised shark scales have been found, along with numerous fin spines. Only the odd vertebra and cranium remain, while impressions of soft tissues are even rarer to find. Teeth are the most common traces left behind, predominantly because they are mineralogically stable and shed continuously throughout a shark’s lifetime. A small handful of scales are all we have left of the earliest recorded sharks. These scales are tooth-like in appearance and supposedly date back approximately 455 million years, to the Ordovician Period. Some palaeontologists are sceptical that these scales are in fact from true sharks, due to their differing appearance to modern-day scales. Siberia was the site of discovery for the oldest confirmed shark scales, which date back an estimated 420 million years, found in early Silurian deposits. Categorised under the genus Elegestolepis, only the scales endure so scientists remain in the dark as to what the rest of the shark looked like. Similar-aged scales were found in Mongolia and were assigned to the genera Mongolepis and Polymerolepis. In the Devonian Period, things become a lot clearer as the shark fossils become more complete. The earliest teeth were found in this period, aged approximately 400 million years. These teeth are crucially different to today’s shark as they are two-pronged and very small. They belong to Leonodus, an ancient, possible freshwater shark that could be an extension of the xenacanth family. The oldest known fossilised shark braincase is from the mid-Devonian period and is estimated to be 380 million years of age, possibly belonging to a xenacanth. Gavin Young found the oldest partially articulated fossilised shark remains, which combine a weird mix of features, possibly also originating from a xenacanth. Young called this shark Antarctilamna and further fossils from this species were discovered in Australia and Saudi Arabia. Supposedly this animal had a stout spine in front of the long, low dorsal fin, as well as two-pronged teeth. Antarctilamna is the earliest verified ancestor of the modern shark, proving that sharks as we know them existed by the middle Devonian Period, if not before.